It’s nothing like the 2018 Toyota Corolla iM. 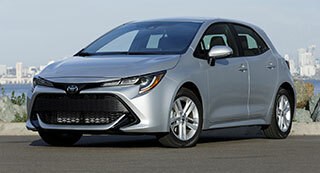 Its replacement, the 2019 Corolla hatchback, has a longer wheelbase of 1.5 inches and is lower by an inch, wider by 1.2, longer by 1.5, with a hood 2 inches lower than its predecessor. The previous 1.8-liter power train has been replaced by a lighter 2.0-liter inline-4 cylinder generating 168 horsepower @ 6600 rpm and 151 pounds-feet of torque @ 4800 rpm. It is mated to a continuous variable transmission or you can go for the 6-speed manual. Want to shift to sport mode? Just switch on a button by the leather-wrapped shifter knob. Either way, you are assured that this classy Corolla will get up to speed with urgency, and slow down as quickly and with self-assurance. The retuned MacPherson strut front and multilink rear suspension soak up obstacles with ease and maintain stability in all types of tricky situations. Though not as responsive as one would like, the electric power steering is precise and crisp. Up front, the new design of the hatchback is sleek, sharp and eye-catching. Flanking the slim, J-shaped bi-beam LED headlights and fog lamps is a rounded nose with a trapezoidal under-grille decked in satin chrome. A rear chrome diffuser and spoiler enhance the aggressive outward appearance. The practical cabin is simply laid out with piano-black gloss and metallic accents on the dashboard. For those who like to be in control of the gears, try the steering-wheel paddle shifters for some spirited driving. Rear-seat passengers can stretch to take advantage of ample leg/shoulder room. Other standard amenities are a dual auto a/c, 8-inch touchscreen, 8-way power driver’s seat, 60/40 rear fold seat, two-tone color leather seats, 7-inch color TFT multimedia screen, and a manual tilt/telescopic steering column. Dual front and side airbags, driver knee airbag, side curtain airbag, vehicle stability and traction control, four-wheel antilock brakes with electronic brake distribution and brake assist, three-point seatbelts for all, keyless entry, blind spot monitor, front/rear crumble zones, rearview camera, daytime running lights and tire pressure monitoring system are standard. The no-cost Toyota Safety Sense 2.0 translates into a pre-collision system that detects pedestrians, lane departure assist and dynamic cruise control. The fine-looking Corolla hatchback is incredibly agile with a peppy engine, which provides ample punch to maneuver in rush-hour traffic. It eked out an impressive average of nearly 33.2 mpg in city/highway driving, matching EPA estimates. Thrifty fuel consumption, reasonable price and more-than-adequate rear passenger room make this an attractive buy. Besides, Toyota’s reputation for durability and dependability should help seal the deal. 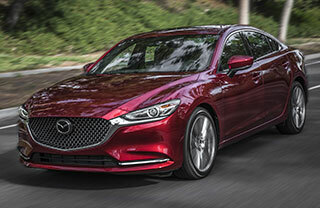 Among the midsize sedans in the market, the Mazda6 is probably the most enjoyable and energetic ride. We have driven a variety of power trains but the all-new version in the 2019 sedan is among the finest. Our Signature trim was equipped with a 2.5-liter turbocharged, inline-4 engine putting out 227 horsepower @ 5000 rpm and 310 pounds-feet of torque @ 2000 rpm. Transmission choices are a 6-speed auto or 6-speed manual. In keeping with Mazda’s technology-driven products, the direct-injection Skyactiv uses a torque boost with a high compression ratio to result in impressive fuel savings. No wonder the Mazda6, available in the fully loaded Signature, boasts 23 city/31 highway (auto) on a 16.4-gallon tank. Sitting on the monocoque body is a gunmetal grille design with the familiar Mazda badge housed in black horizontal lines and piano black-topline trim. It is surrounded by eagle-eye shaped LED headlights and fog lamps. The Signature model comes standard with Nappa leather seats, ultra-suede trim inserts and black headliner. The 8-inch touch screen, part of the Mazda Connect navigation/infotainment system, is easy to operate via a command control button. The grip on the race-inspired tilt/telescopic, three-spoke steering column is solid. Other amenities include dual auto a/c, power moon roof, 8-way power driver and 6-way front passenger heated/cooled seats, 60/40 rear seat, 11-speaker Bose system, overhead console, push-button start and paddle shifters. You feel secure with standard dual front and side airbags, side curtain airbag, dynamic stability and traction controls, four-wheel antilock brakes, lane keep assist/departure warning, smart city brake support with collision warning, blind spot monitor, rear-cross traffic alert, radar cruise control, hill launch assist, three-point safety belts, rearview camera, tire pressure monitoring system and daytime running lights. As noted at the outset, there are several midsize sedans on the road but few as sporty and nimble as the Mazda6. The family car touts pleasing styling inside and out, laudable fuel economy and exceptional braking. This is one enjoyable, energetic ride that will leave you asking for more! 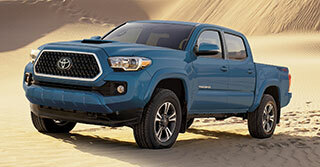 THE RIDE: Four-door, five-passenger 2019 Toyota Tacoma 4X4 TRD Sport midsize pickup. DOWN THE ROAD: The power train continues to offer a composed ride while absorbing the bumps of rough surfaces with skill and sure-footedness. TECH & PERFORMANCE: A 3.5-liter DOHC V-6 engine, which is mated to a 6-speed automatic transmission, cranks out 278 horsepower at 6000 rpm and 265 pounds-feet of torque at 4600 rpm. Suspension is handled competently via an independent coil spring double wishbone front and a leaf spring rear. The electric power rack-and-pinion steering has a solid and communicative feel, making the pickup easy to place at sharp curves. Tow capacity is a laudable 6,400 pounds. LOOK & FEEL: Projector-beam headlights with LED daytime running lights surround a gray grille with smoked finish and chrome surround and color-keyed hood scoop, power-out mirrors and door handles. TACOMA stamped in all caps in the rear is an instant giveaway that this is indeed Toyota’s midsize truck. Climb into the cabin and you won’t find a reason to complain about seating space. Traditional gauges for speedometer, tachometer, fuel and engine oil pressure are easy to read. The center stack of audio and climate knobs is within the driver’s convenient reach. A dial on the dash offers the option of 2WD, 4L and 4H. There also is an adjustable tie-down cleat 6-foot-long bed to easily haul your purchases from the neighborhood home store. The power-slide rear window can be handy. Other customary amenities include a/c, leather tilt/telescopic steering column and shifter, adaptive cruise control, 7-inch touchscreen for nav, phone and audio controls, power windows/door locks, push-button start, 4-way front and 60/40 rear seats, wireless phone charger, easy lower-and-lift lockable/removable tailgate and overhead console. SAFETY FIRST: Dual front airbags, side curtain airbag, front knee airbags, four-wheel antilock brakes, stability, traction and trailer sway controls, rearview camera, smart-stop technology, daytime running lights and tire pressure monitoring system come at no cost. The standard Toyota Safety Sense 2.0 includes a pre-collision system that detects pedestrians, lane departure assist and dynamic cruise control. OUT THE DOOR: $37,075, plus tax, tag, delivery and destination charges; price as tested is $42,430. WHY DIG IT: So, why should you buy the Tacoma? Well, it’s not a full-size pickup but serves the purpose of one with commanding cargo and towing capability, and adequate fuel efficiency while delivering a no-frills ride, even off the beaten path!